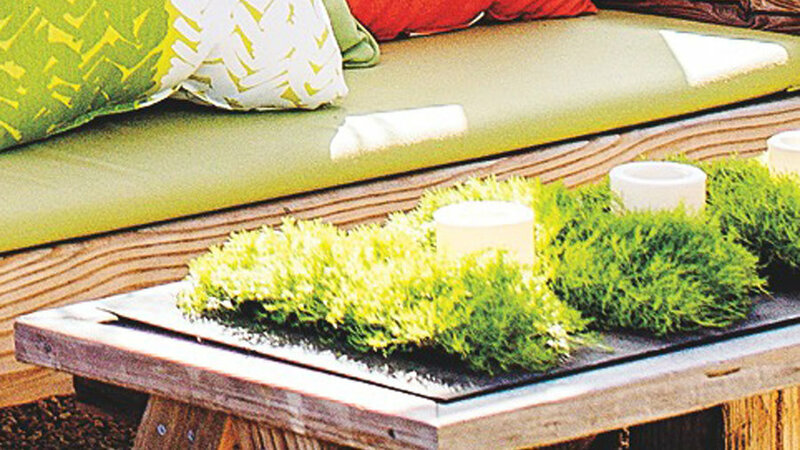 This low planter box, faced with recycled wood and Connecticut Bluestone, hugs a little backyard retreat. It’s filled with mounding thymes and potted citrus. “There’s something appealing about materials that have already been well loved,” says Leslie McKenna, who designed the retreat with her Dad, Eric (www.mckennalandscape.com). 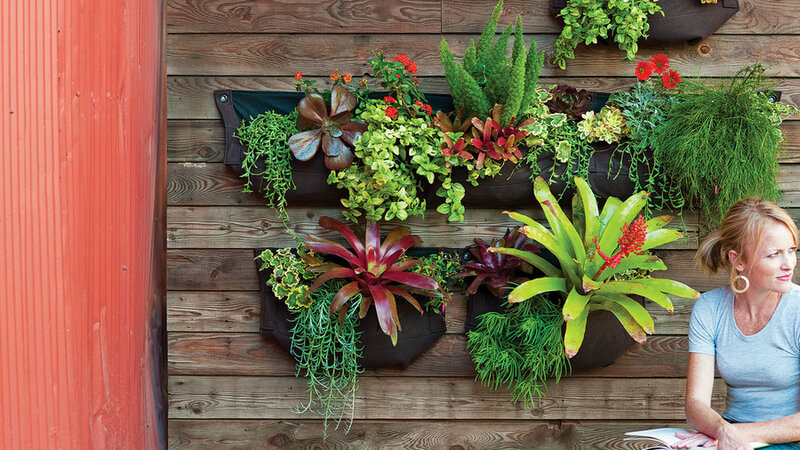 A vibrant jungle thrives on this San Francisco wall, designed by Flora Grubb Gardens () using Woolly Pockets (). Made from recycled plastic bottles, the pockets are filled with soil, planted, and hung. 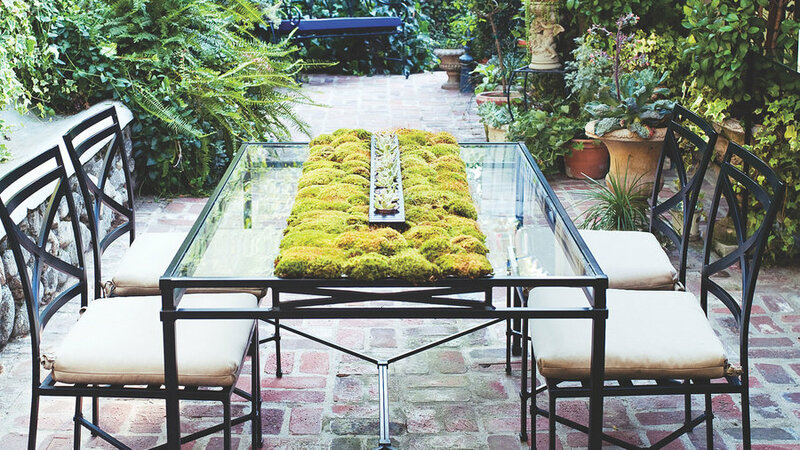 Greenery keeps hydrated and water doesn’t leak because the pockets are lined with moisture barriers—they can be used indoors, too. Bands of Irish moss, cut from nursery flats and set into a waterproof metal tray, along with LED candle lights add greenery and glow to a recycled wood table for an evening party. For a more permanent display, fill the tray with crushed taffy gravel. 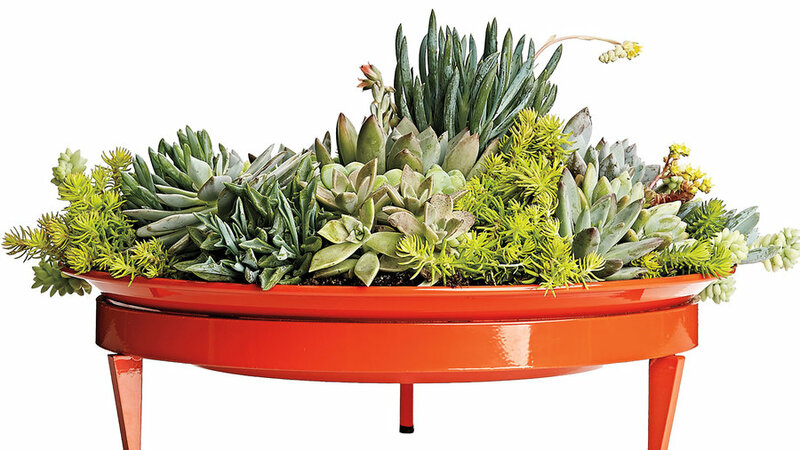 Use this 16-inch-wide dish as a shallow planter box or fill it with water for a mini reflecting pool. Either way, the parrot red color makes this a standout feature. Basin Mod Dish, $129; www.shopsteellife.com. 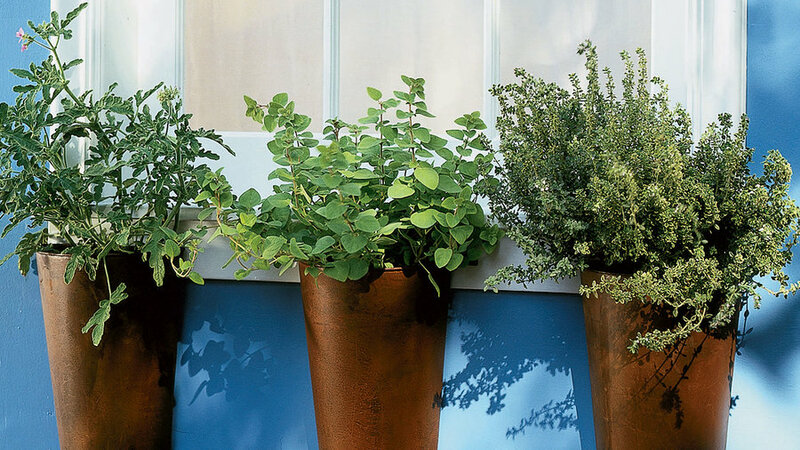 These simple flat-backed rusted steel buckets, each about 6 inches wide and 1 foot deep, offer a new twist on herb gardening. 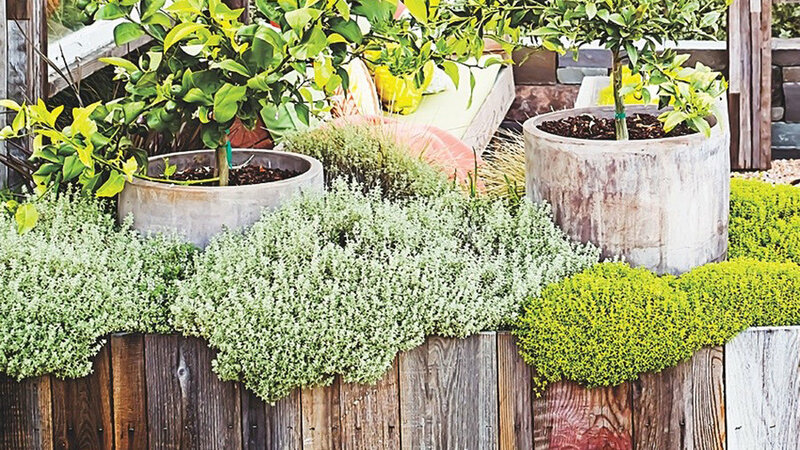 When lined up along a kitchen sill, clipping fresh herbs for cooking is as easy as opening the window. From left to right are ‘Rober’s Lemon Rose’ scented geranium, Greek oregano, and variegated lemon thyme. 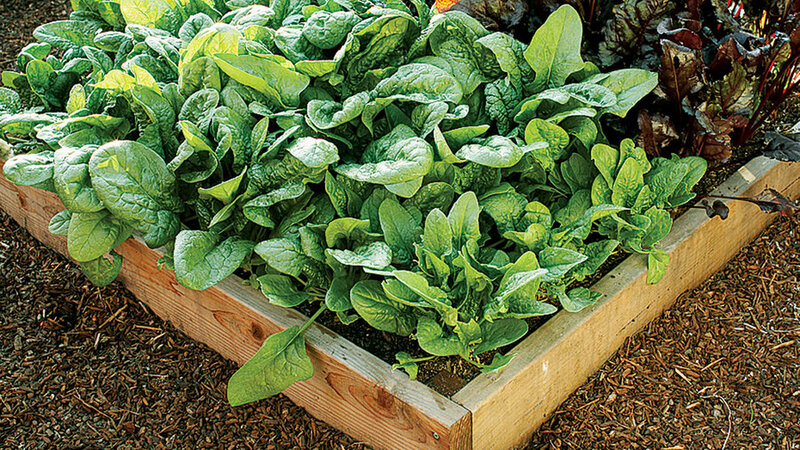 Spinach (three to four sixpacks) and ‘Bull’s Blood’ beet greens (three sixpacks) fill this little 4-by-4-foot, built like a picture frame and set onto the soil. a votive tray with a Graptopetalum succulent in each candle slot—no need for soil. Mist to keep the arrangement fresh. 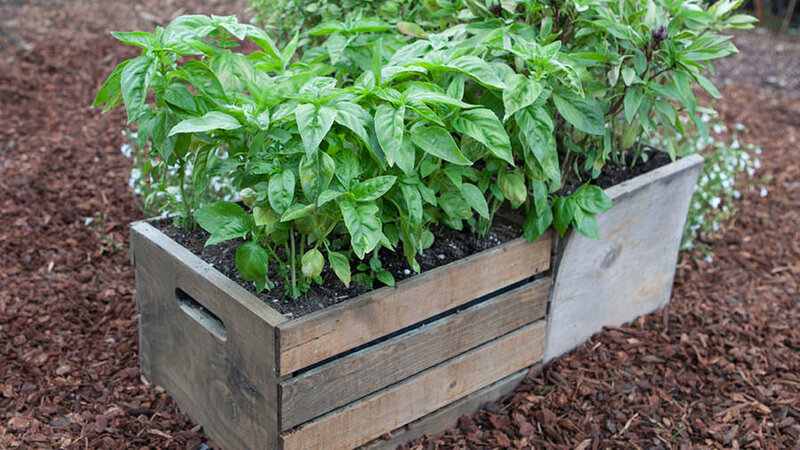 We gave this old wooden box new life as a planter. Filled with a fast-draining soil mix, it’s the perfect vessel for growing a lusty crop of basil in a small space. 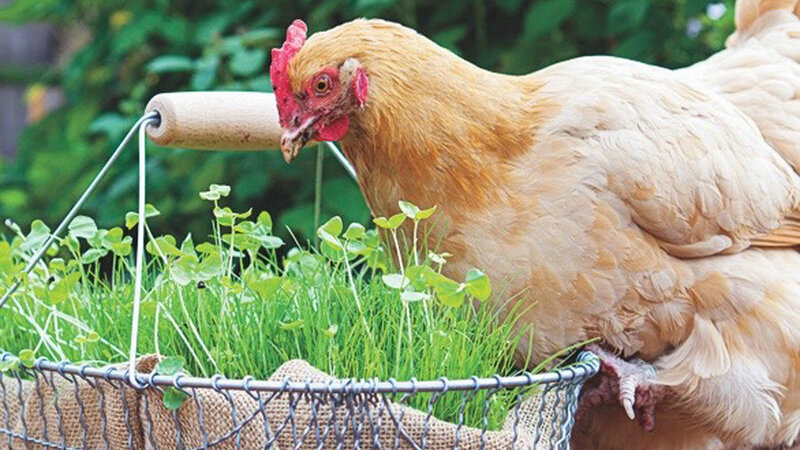 A wire basket, lined with burlap, let our Test Garden hens nibble at greens in style (every chicken’s dream). As if they were at an all-you-can-eat buffet, they went wild for the chicken forage blend from Peaceful Valley Farm & Garden Supply (), which we planted there from seed. An omega-3–rich mix of alfalfa, clover, and flax helps hens make healthier eggs.